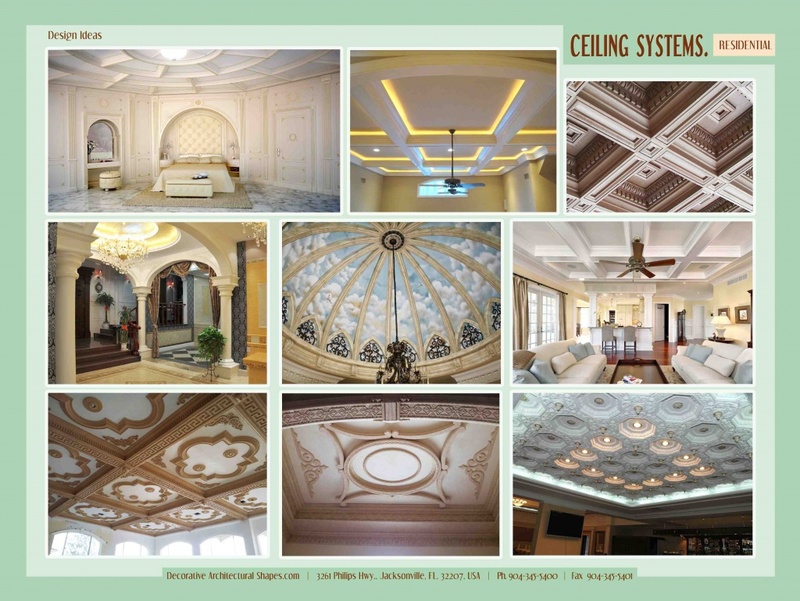 Ceilings are quite often overlooked in many construction or remodeling projects, but, if decorated properly, they can peak the architectural design of any project. 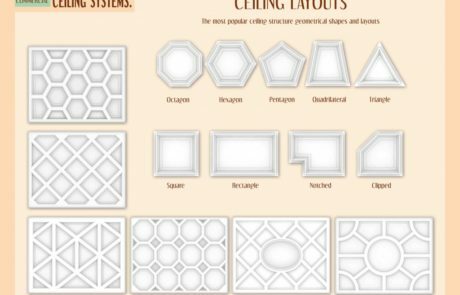 This is precisely the reason why Decorative Architectural Shapes specializes in creating custom ceiling coffers. 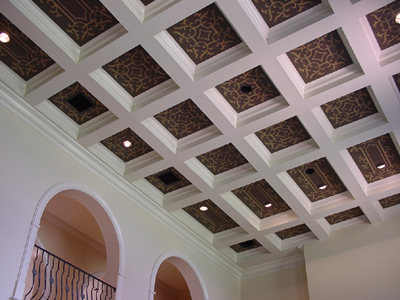 Ceiling coffers are recessed panels complimented with decorative trimming, often resembling a waffle like pattern. They most commonly come with squared recess panels but have also taken the form of other polygons. 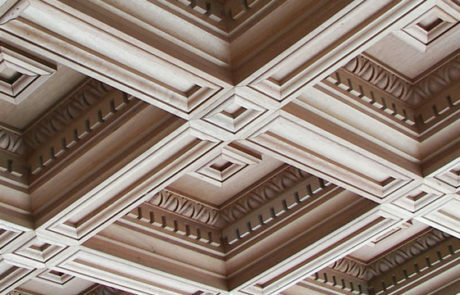 The use of coffered ceiling decorations dates back to ancient Roman and Greek architecture when the panel technique offered a lighter alternative to the more common marble and stone ceilings of the time. 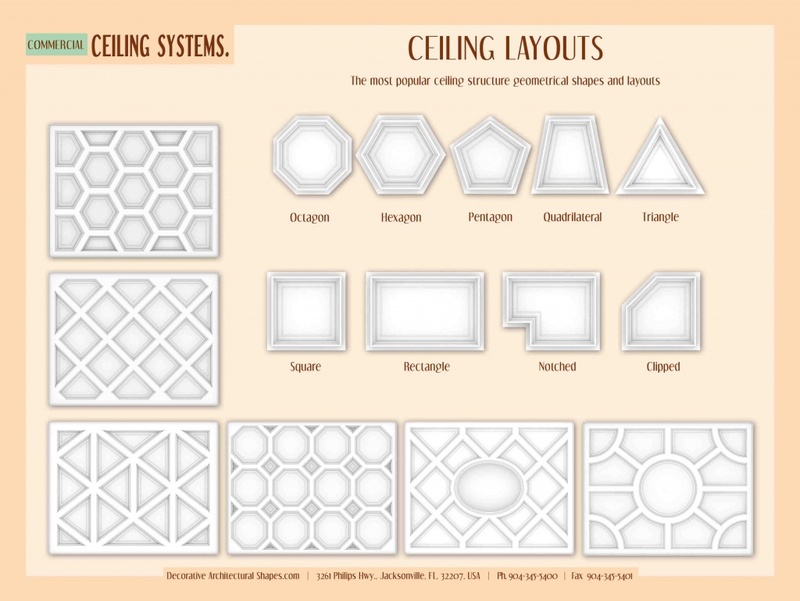 Originally, ceiling coffers have been designed to be square, rectangular and even octagonal. 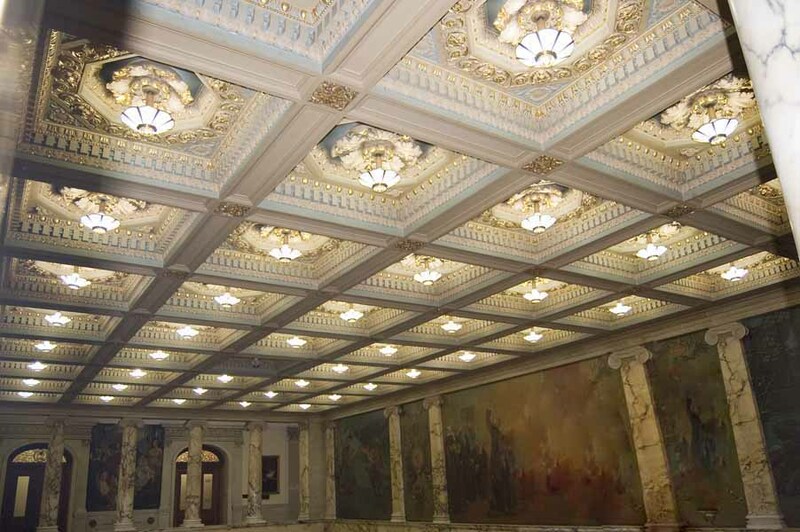 The most popular type of ceiling coffers feature deep recesses and were initially made of stone; however, stone became too cumbersome to work with so a lighter weight material was desired. Eventually wood replaced stone coffers and, today, we use polystyrene foam. Polystyrene foam, or EPS foam, makes the coffer structure relatively weightless but provides the same complex and creative solution as wood. 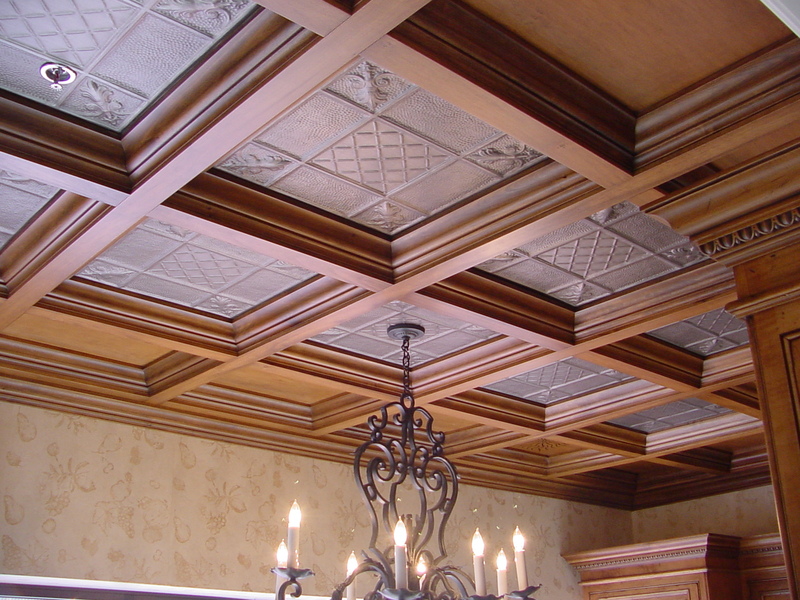 Decorative Architectural Shapes offers an affordable alternative to the coffered ceiling system without sacrificing the prestigious element intended for its design. Installation is no longer the daunting task that it used to be. The foam coffers, trim, main runners and cross tees do not need to be installed into the existing grid structure. Instead, they are installed over the ceiling, allowing the most optimum use of space possible. 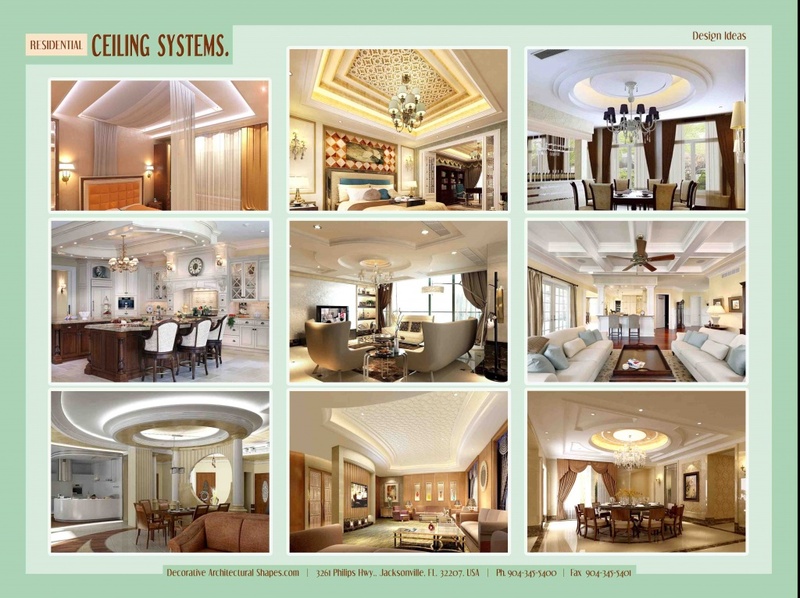 The limitations put forth by inconsistencies in the ceiling surface no longer hinder the installation process either. 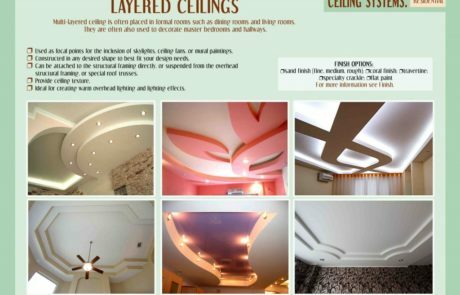 Issues with the integrity of the ceiling such as sloping, swelling or sagging can be considered irrelevant if not too severe. 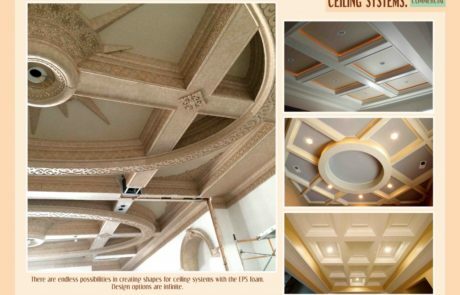 Decorative Architectural Shapes offers the most practical solution to these problems by providing custom designs to precisely complete any ceiling project in its entirety. 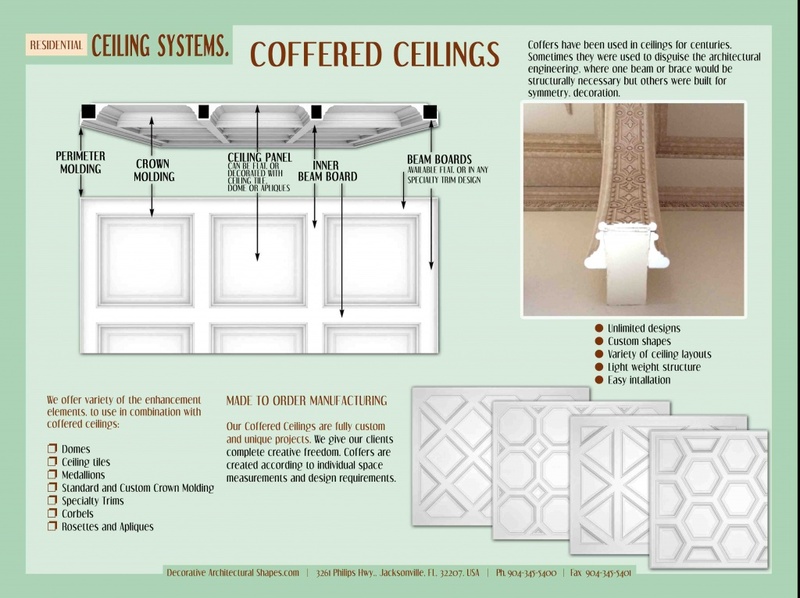 Our integrated coffered ceiling systems offers our customers the most practical and modern method of decorating their ceilings, independent from their current infrastructure. 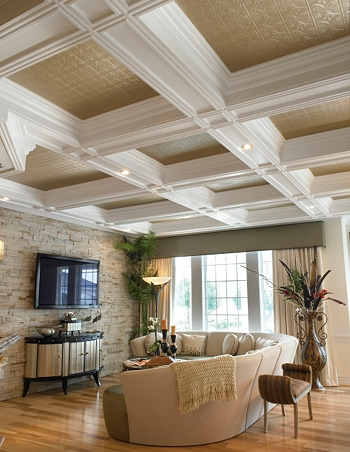 The great thing about a coffered ceiling is that its style can be adjusted to suit many different decors. For example, if square panels are used with plain-edged trim and everything is finished in one color, the look can be very modern and beautiful. 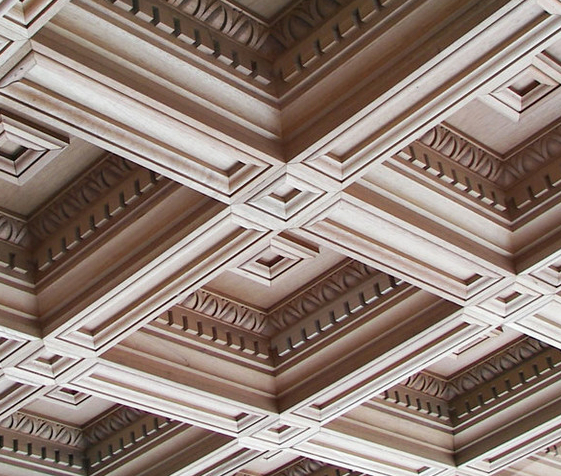 Our coffered ceiling system eliminates all of the installation issues related to inconsistencies in the existing ceiling surface such as sloping, crowning, sagging, humps, waves or any combination of these. This design, with its integrated ceiling panel, allows for complete and independent final adjustment of each coffer module for a perfectly level and straight final finish each and every time. 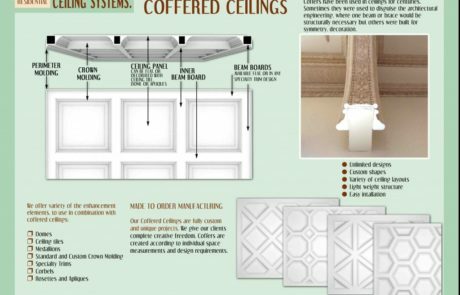 Our coffered ceiling system eliminates all of the installation issues related to inconsistencies in the existing ceiling surface such as sloping, crowning, sagging, humps, waves or any combination of these. This proprietary design, with its integrated ceiling panel, allows for complete and independent final adjustment of each coffer module for a perfectly level and straight final finish each and every time. EPS foam is almost weightless, which is very important for the building structure, when wood or stone don’t come even close. EPS foam is perfect material for imitation. 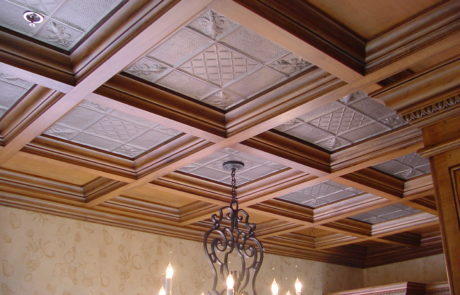 Coffers made of EPS foam can be designed to look like wood or metal. Can be painted any color or multiple colors. Any design/style is possible. Our designers create custom layouts for every project based on the customer’s demands. The product is very easy to install. 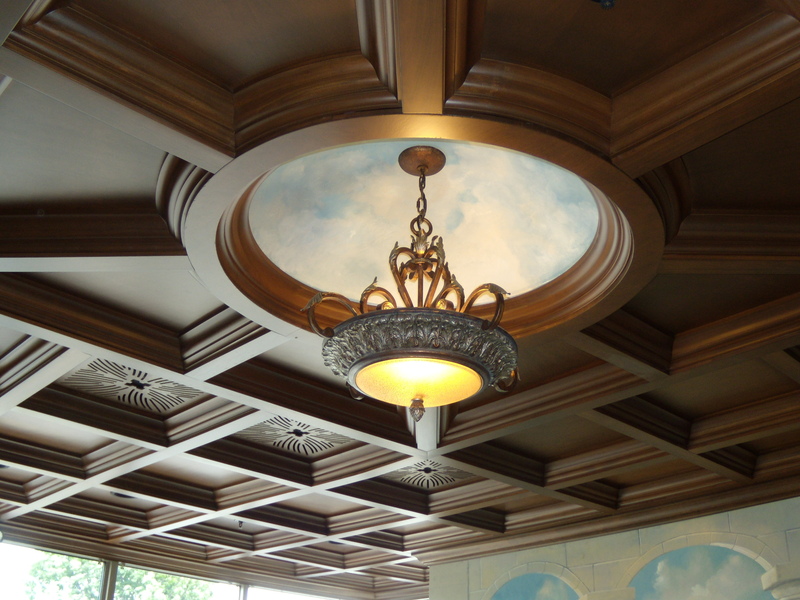 When it comes to decorative wood drop ceilings, we have been the experts for the last 25 years. We offer many styles and designs allowing you to create a unique room. The drop ceiling concept allows you to have a stunning ceiling even in a basement where you might need access to ductwork etc. 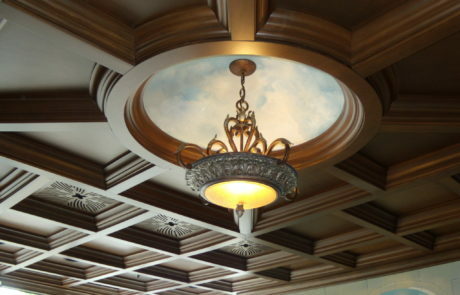 Over the years we have developed creative ways to work with lighting, venting, height changes, soffits, home theater components and other mechanicals that affect a ceiling. 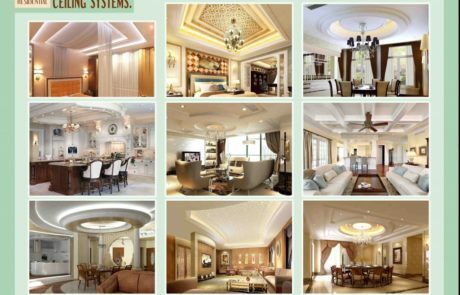 We have styles and ideas for high ceilings or low basement ceilings as well as cathedral ceilings and standard height ceilings. 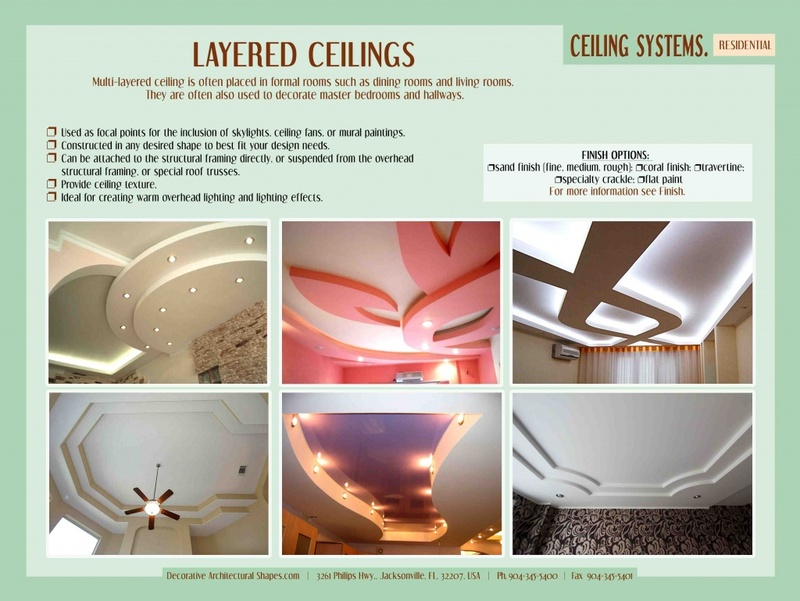 So bring us your ceiling design or ceiling ideas, and let us show you how to make them a reality. 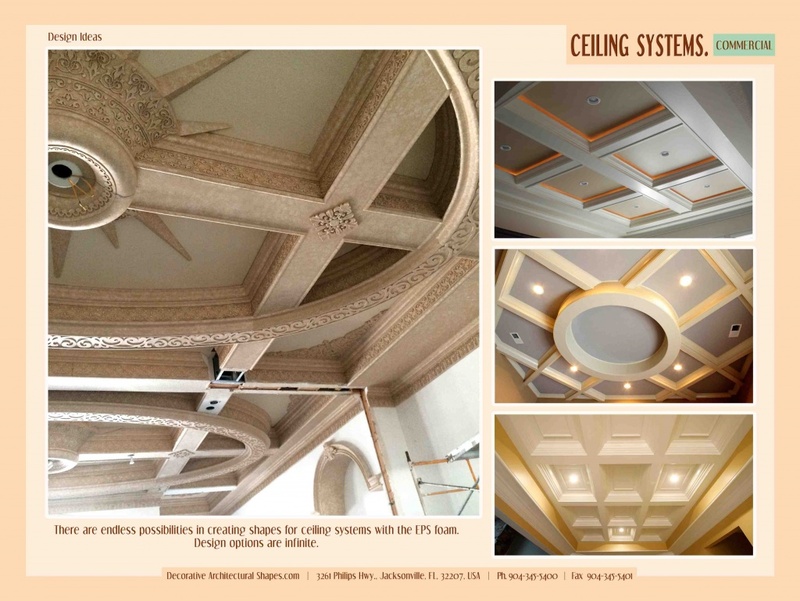 Please give us a call today to inquire about a potential ceiling coffer design you would like to install in your home or business. Our representatives will guide you through the production process to help you achieve the style you have in mind. We specialize in all custom designs and we welcome any ideas that you may have. 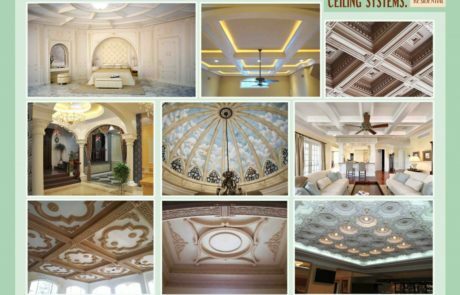 is based in Jacksonville, Florida, and specializes in the production of cast stone architectural shapes, EPS foam architectural products, and Stucco architectural decorative elements.